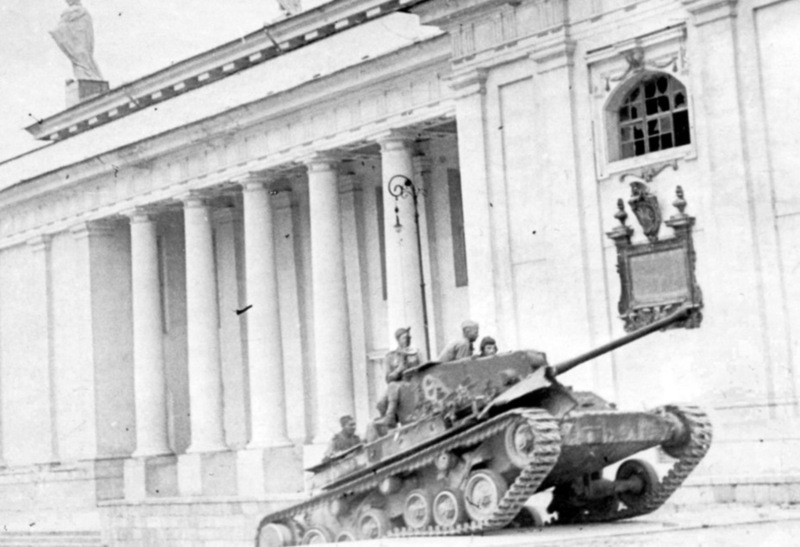 In the spring of 1943 the variety of British tanks sent to the USSR dropped radically. Matilda tanks were no longer sent, the Churchill nearly vanished from shipping manifests. The Valentine remained the only type of tank sent by the British in large numbers. Even though the British themselves nearly stopped using it by the spring of 1943, they were still in demand with the Red Army. This was especially true for the Valentine IX, the version with a 6-pounder cannon, which had to revert to the two-man turret. It was clear that the 2-pounder gun was obsolete after the first clashes with German tanks in North Africa in 1941. Work on improving the firepower of British tanks began that same year. The 6-pounder (57 mm) gun, work on which began back in 1938, was the favourite. Mass production began only in 1942. 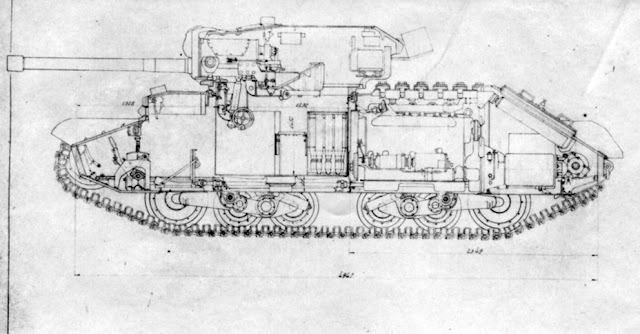 The Mk.II (anti-tank) and Mk.III (tank) variants were shorter than the initial design. However, even the 43 caliber version was quite good. Even the thickening of the front armour of the PzIV to 80 mm did not fully protect it from the new cannon. 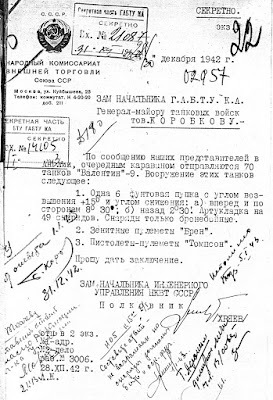 The first source of information on the Valentine IX for the Soviet army. A new turret was needed to re-arm the Matilda tank, and this project did not proceed past experimental work. 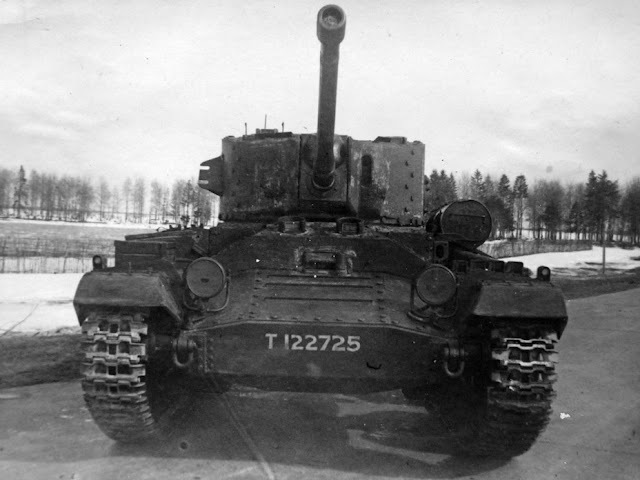 The Churchill also needed a new turret, but this modification was more fortunate. 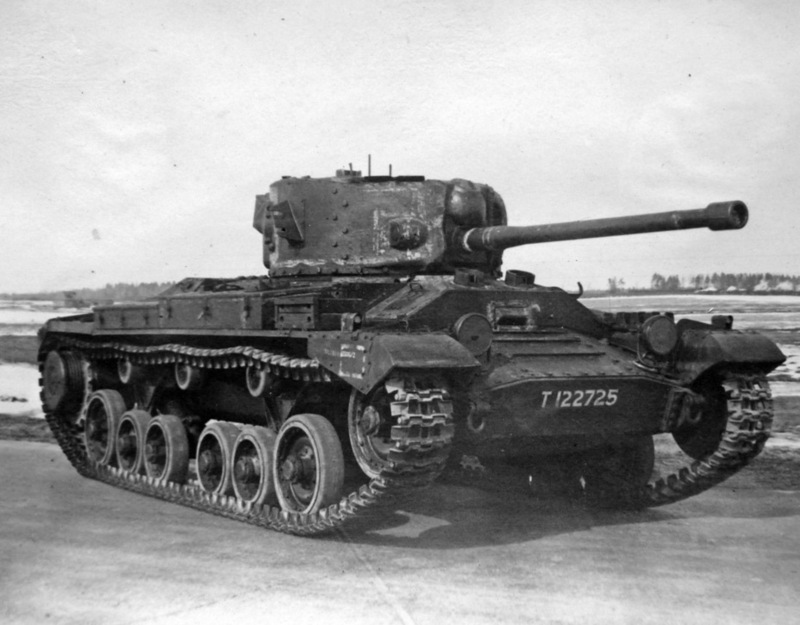 The Churchill III and IV ended up being the longest-living British tanks. Their fighting career began at El-Alamein and ended in 1945 in Berlin. The career of the Crusader and Valentine with the same gun was less stellar. In both cases, the turrets had to be redesigned. The Crusader III saw battle first, and the new gun was clearly an improvement. However, it was still worse than American Sherman II and III tanks. The Crusader III's career came to an end in the spring of 1943. In the future these tanks were used to make SPAAG chassis and tractors. The Valentine had to undergo a serious turret modification to receive a new turret. Taking the Valentine III turret as a start, Vickers engineers freed up space by reducing the turret crew to 2 men. The gun fit into the turret, but the coaxial machinegun and smoke bomb launcher were removed. This tank was supposed to be accepted into service as the Valentine VIII, but the order for this variant was cancelled. The British decided to fully switch to the GM 6004 engine. 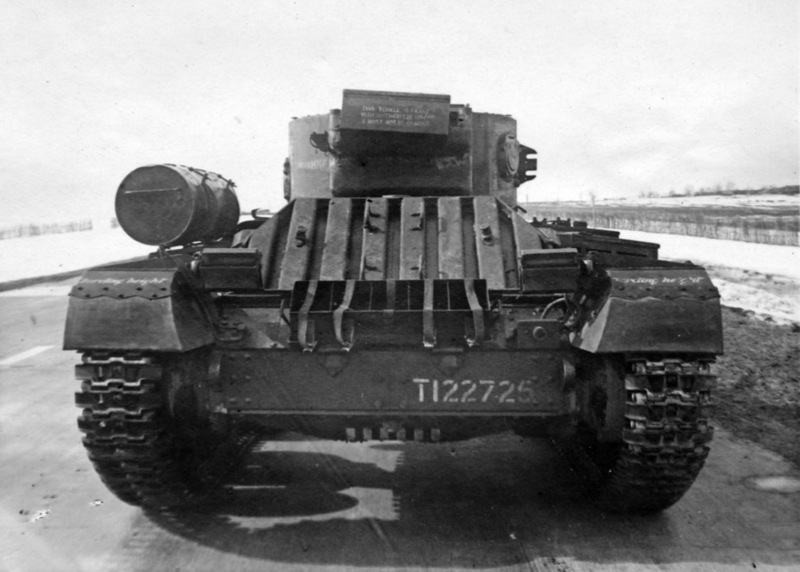 The result was the Valentine IX tank, the only 6-pounder armed Valentine to see service with the British army. Later, the Valentine X was introduced. This version once again had a coaxial machinegun. The final modification of the tank, the Valentine XI, had a 75 mm gun. These tanks served in the British army until the end of the war, but only as commanders' tanks with dummy guns. As for the Valentine IX, they appeared on the front lines by late 1942, but were removed from combat starting with the spring of 1943. Cutaway drawing of the Valentine IX made during its study. 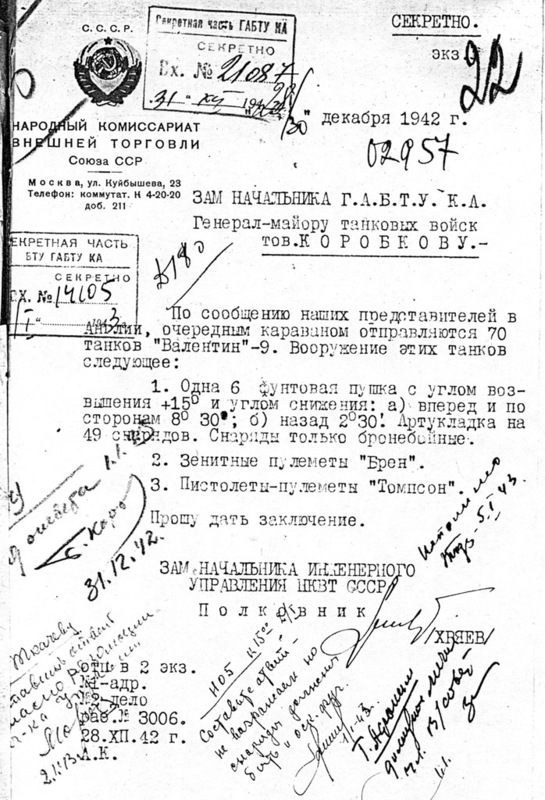 The USSR learned about the new type of tank right at the end of December of 1942. Soviet representatives in Britain reported that the USSR will soon receive 70 new tanks armed with 57 mm guns. The first batch of new British tanks arrived with the JW-53 convoy in February of 1943. 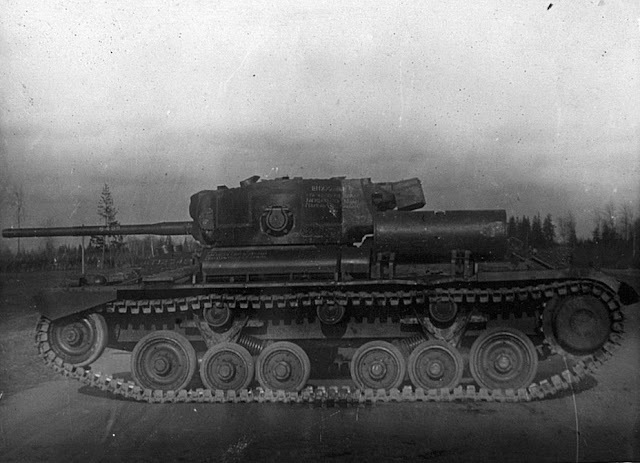 By then Soviet representatives managed to collect a good deal of information about this tank. On January 21st, 1943, the 20th Tank Brigade showed these tanks in action to the Soviet representatives. According to British information, the 57 mm tank gun could penetrate 40 mm of armour at 1829 meters and 65 mm at 914 meters. The mass of the tank increased to 18-19 tons. 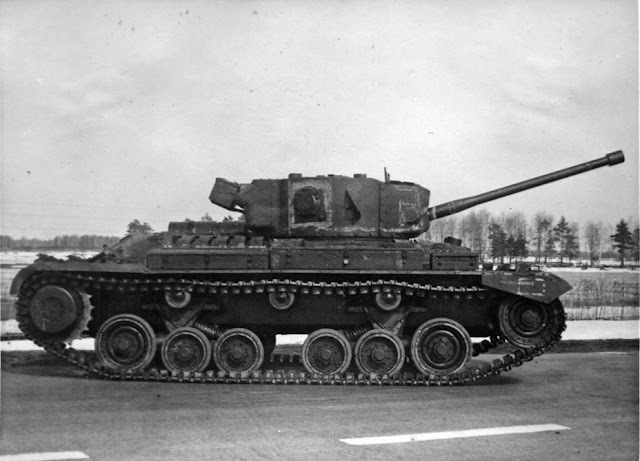 Soviet specialists questioned the reliability of the new tank, since the British tankers let slip that brakes had to be replaced every 400-600 km. Vickers also reported that the load on the chassis was close to its limit. Senior tester K. Olkhovskiy demanded that the British send additional spare parts with every tank. Olkhovskiy visited Elswick Works on March 8-9th. There he learned that the move from the Valentine V to the Valentine IX was done without trials, as the increase in mass was deemed to be slight. There was also a strange situation with acceptance of these vehicles. The War Ministry was incredibly trusting in its interactions with Vickers. Olkhovskiy learned about the modernization of the Valentine IX, on which the coaxial machinegun was to make a return. Finally, Vickers engineers let slip about the development of the Vanguard I, the unsuccessful replacement for the Valentine. 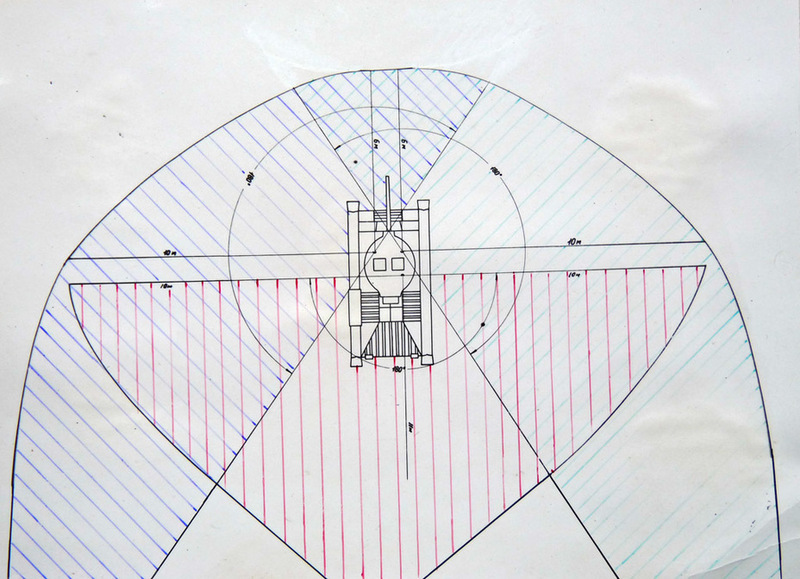 The top view shows how it was possible to fit the crew into the turret along with the 57 mm gun. The introduction of a Valentine armed with a 6-pounder gun did not mean that it would immediately replace all previous versions. Valentine III tanks arrived with convoy JW-52 along with Valentine IX tanks. The same situation repeated itself. After a long break in shipments by northern convoys, the tanks were shipped along the southern route. The most numerous variant was the Canadian Valentine VIIA. These tanks flowed through Iran, with 711 shipped in 1943. As for the Valentine IX, 49 were sent from the end of July to the end of August, 16 more in September, and 46 in December of 1943. To compare, 324 Valentine IX tanks arrived through the northern route, even with the interruptions. Also, 6 tanks arrived through Vladivostok. 91 Valentine IX tanks came through the southern route in 1944, most of which were used. 36 tanks of this type were received from Polish units located in Iraq. There is a rather significant disagreement regarding tanks sent through the northern route. 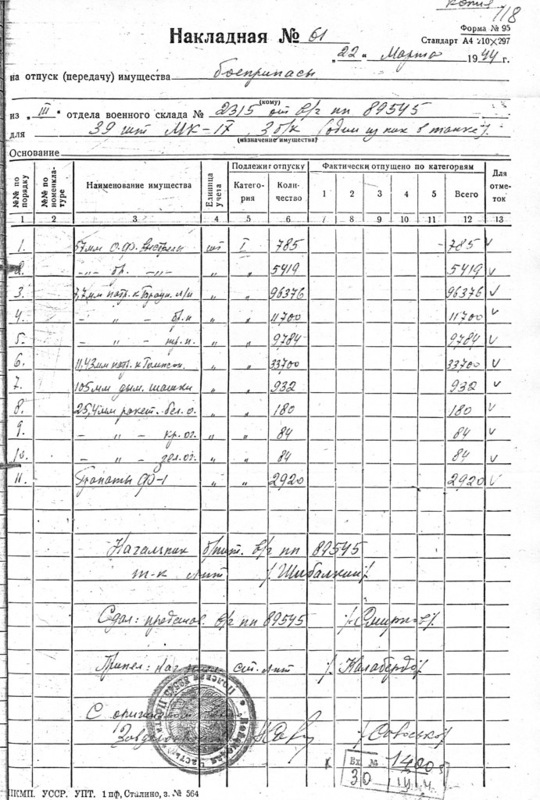 According to reports for December 1944, 221 tanks arrived with JW-55-JW-58, after which shipments stopped. Including the 324 tanks that arrived in 1943, the total number of Valentine IX tanks that arrived through the north was 545 units. 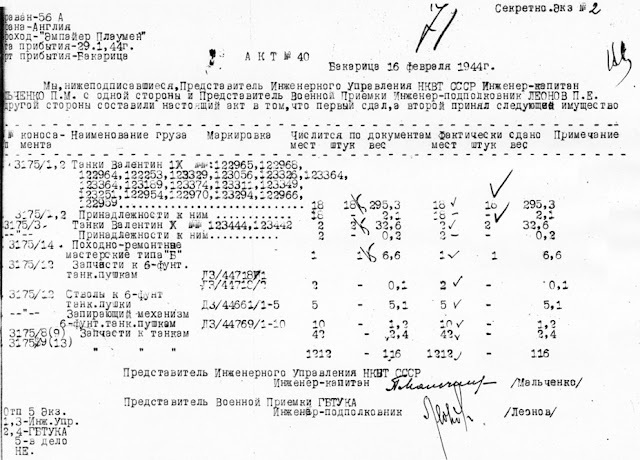 Meanwhile, documents dated July 1st, 1945, list 621 tanks of this type delivered through the northern ports. Perhaps the difference comes from the fact that many tanks arrived in December of 1943, which led to a 76 tank "surplus". The fact that 621 is the wrong figure is also confirmed by British sources. According to them, 836 tanks of this type were sent to the USSR, and 818 arrived at their destination. If the number of tanks received through the northern route was 621, then the USSR would have received 863 tanks (621 through the north, 236 through the south, and 6 through Vladivostok). It's hard to believe that the tanks multiplied en route, so the number 787 (545 through the north, 236 through the south, 6 though Vladivostok) sounds more believable. 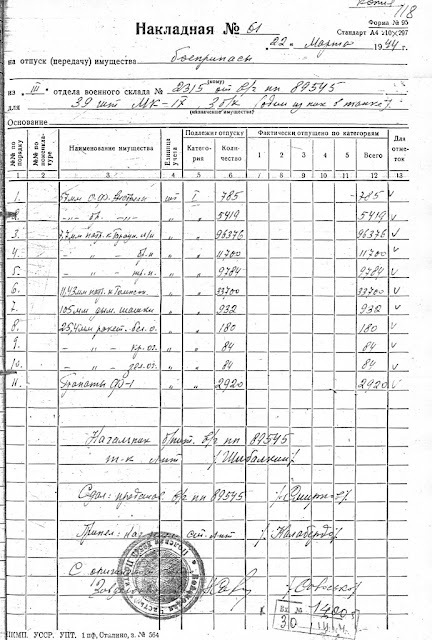 Record of the first Valentine X tanks that arrived in the USSR. 64 tanks arrived in total. Let us mention the Valentine X, the last variant of the Valentine tank that was sent to the USSR. The first tanks of this type arrived with JW-56A in late January of 1944, and were only recorded in February. Based on the acceptance records, most of these were tanks built at Elswick Works. In total, JW-56 through 58 brought 64 tanks of this type. This almost matches British reports of 74 tanks sent and 66 received. The British sent more than half of all Valentine X tanks to the USSR, as only 135 were produced. This tank was unlucky and almost never got in front of a camera. 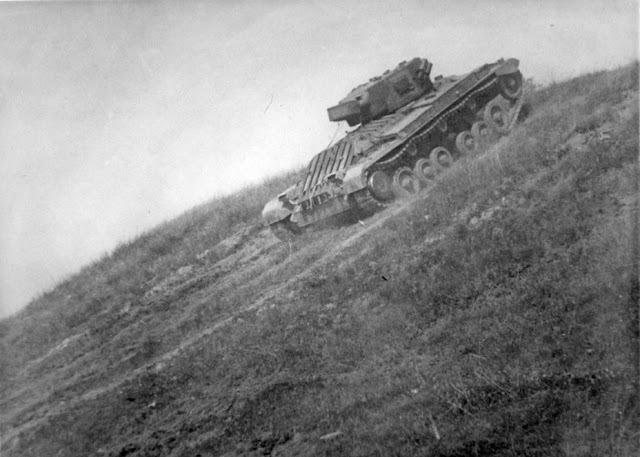 After the first Valentine IX tanks arrived in the USSR, the GBTU decided to perform proving grounds trials. Based on the correspondence between the GBTU chief, Lieutenant-General Vershinin and the People's Commissariat of Foreign Trade, the results of the trials would determine if more of these tanks would be ordered. It is possible that this order resulted in serious changes to Soviet purchasing policy in the West. Now the USSR received a small batch of tanks to try out before any large shipments of new vehicles. The Red Army could have received an even bigger surprise in early 1943, as the British seriously considered sending Crusader III tanks. 36 tanks of this type were earmarked for shipment in April of 1943 with JW-55. JW-56 and -57 would bring 421 more of these tanks. The British were trying to dispose of useless tanks that were replaced by the Sherman II, III, and V. Vershinin spoke out categorically against this "gift" in a letter written on March 11th, 1943, where he called the Crusader III a modern tank, but with thin armour. The Liberty engine was identified as another weakness. The "crusade" to the Red Army ended before it began. Valentine IX at the NIBT proving grounds, March 1943. According to the trials program signed by Vershinin, an 800 km march would follow the inspection of the tank. 300 km would be done on a highway, 300 on dirt roads, and 200 off-road. The trials would determine the performance on icy dirt and in snow banks. Firing trials to determine the rate of fire and penetration were also performed. Thanks to optimization of the armour, the weight increased very slightly. The Valentine IX with WD number T.122725 was sent to the NIBT proving grounds on March 14th. This tank was built by Elswick Works and arrived in the USSR on February 22nd, 1943, on board the "Mossovet" steamship. 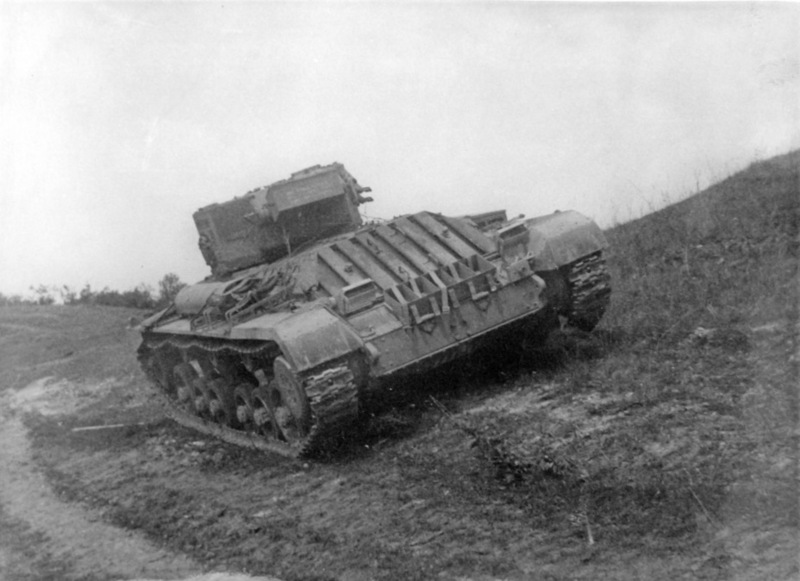 The Valentine III was supposed to be tested alongside the tank, but there was a mistake. Instead of a Valentine III, a Valentine II was sent, the same one that is currently on display at Patriot Park. This tank with WD number T.27543 received a small upgrade: a "collar" covering up the turret ring from the front and additional armour in the front hull. The characteristics of the tank were also compared to those of the "Valentine III with a GMC engine", likely the Valentine VII that was tested at the NIBT proving grounds in 1942. The march from the Gorkiy Armoured Vehicles Center to the NIBT proving grounds counted towards the trials. This stage of the trials revealed that not all was as bad as reports from England made it seem. The mass of the Valentine IX was only 17 tons, the same as of the Valentine VII. The Valentine II was a little lighter at 16.5 tons. The mass remained the same due to thinner side armour. This was acceptable, as tanks were mostly hit from the front. Specialists remarked on the additional 148 L fuel tank. They were installed back on the Valentine IV, but the NIBT proving grounds did not receive such a tank. Overall changes to the chassis mirrored those made to tanks equipped with 2-pounder guns. A lack of a coaxial machinegun was identified as a clear drawback. The turret drew the most attention. The Valentine was a record setter in its class when it came to increasing the caliber of the gun. First the 40 mm gun turret was enlarged to fit three men, then it held a 57 mm gun, then even a 75 mm gun was installed. This was managed by stretching out the front and rear of the Valentine III turret. Due to the large 6-pounder gun, the turret once again only fit two people, but now had two hatches. As mentioned before, the coaxial machinegun was removed, and the 2" bomb thrower was replaced with a pair of smoke grenade launchers mounted externally. Neither change was liked by the Soviet testers. Since the tank only carried AP shells, it was only good for fighting enemy tanks. The only weapon that could be used against infantry was the Bren machinegun on an AA pintle mount. The tank carried 53 rounds for the 6-pounder gun, 4 100 round magazines for the Bren, 10 smoke bombs, and 12 signal flares. Not a lot, especially for an infantry support tank. The external fuel tank nearly doubled the tank's range. The working conditions of the turret crew were deemed acceptable. No complaints were made about the commander's station (Soviet experts assumed that the gunner would be the commander, whereas the commander was actually the loader). The workspace allowed the gunner to fire comfortably and the aiming mechanisms could be reached without any discomfort. The loader's station was not as good. 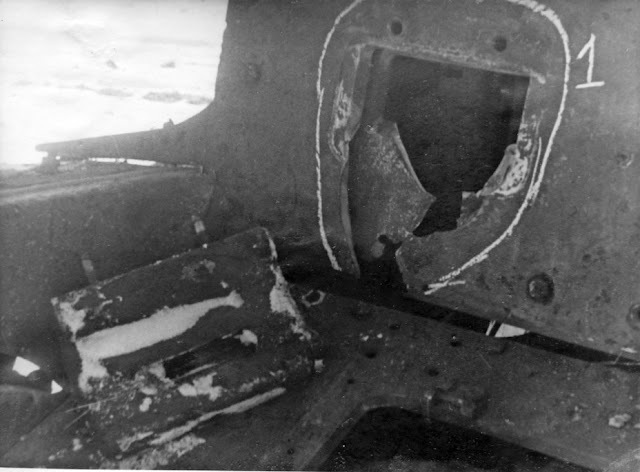 A part of the ammunition was only accessible at certain turret traverse angles. This was only true for the main ammo supply, and the ready rack was not impacted. There were no complaints about visibility. The commander lost his cupola, but the number of MK-IV devices was increased to 3. Two periscopes were installed in the front of the turret, the third in its right rear angle. This gave the loader good visibility backwards. 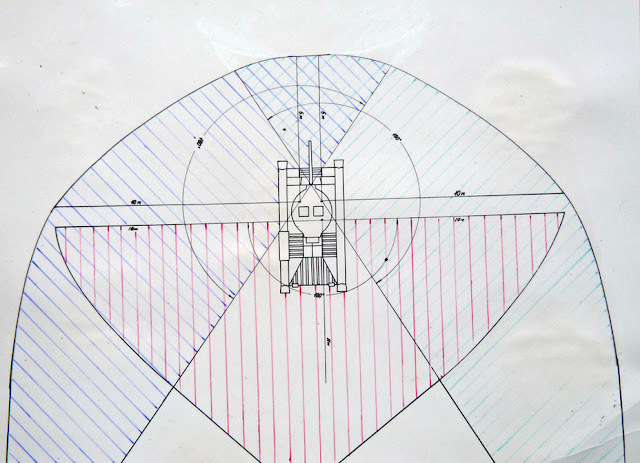 Visibility diagram from the turret. Mobility trials were quite unusual. The Valentine IX tank chosen for trials was located at the Gorkiy Armoured Vehicle Center. To not waste time, the tank was sent to drive to the NIBT proving grounds on its own. The tank drove for a total of 500 km, 287 km on snow covered highway, 163 on paved roads, and 50 on dirt roads. The average highway speed was 20 kph and average movement speed was 20.9 kph, slightly better results than given by the Valentine II. The average speed on dirt roads and off-road was 12-16 kph, compared to the 12-15 kph of the Valentine II. Fuel consumption was 136 L per 100 km on the snowy highway and 131 L on the clear highway. The range was 230 and 240 km respectively. The addition of an external fuel tank was positively received, as it boosted the range by 90%. Fears about the suspension were allayed. The minor breakdowns experienced during the march were not connected with it. The armament of the tank was judged about equal to that of the Churchill III. The 6-pounder gun was tested against a Pz38(t) with predictable results. The British "Valentine IX" and "Valentine III" have equivalent mobility. The tank's armament is meant to fight enemy tanks. The lack of an HE grenade or machinegun makes it impossible to fight enemy infantry or strongholds. Additional reliability trials of the 57 mm gun need to be carried out on a number of samples." The last item has to do with a breakdown of the 57 mm gun during trials. This was not a unique defect, and similar issues were experienced with the Churchill. Some time was needed to correct these problems, as correspondence about this issue continues until the end of the spring of 1943. New track links with cleats introduced in the summer of 1943. Spring trials were not the last that the Valentine IX took part in. Later, in August of 1943, another tank of this type arrived at the NIBT proving grounds. This time only the running gear was tested, more specifically, the tracks. In the summer of 1943 British industry finally remembered the Red Army's requirement of equipping its tanks with better grousers. Valentine IX tanks were shipped with extra cleats on each track link. Reports soon started coming in from the acceptance teams and front line units. The cleats could not be removed and had many issues, particularly with tearing up paved roads. Climbing up a hill showed that the grousers did not help much in summer conditions. Trials held in August of 1943 showed mixed results. Speed and fuel economy were about the same for tanks with grousers or without. After a 251 km march the grousers wore down by 8-10 mm. Driving on asphalt created small pits in the surface, and turning resulted in destruction of the pavement. A group of tanks driving on roads would leave them in need of serious repairs. The introduction of such a track link showed that the British designers did not learn from their mistakes. 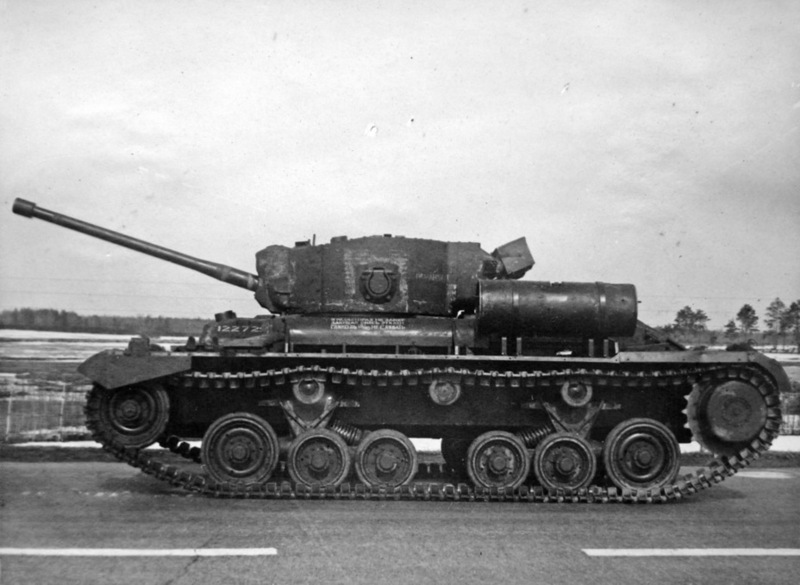 Grousers designed for the Matilda tank also had a very low lifespan on paved roads. Driving at a tilt also had the same results. Additionally, no significant change in off-road mobility was noticed during summer trials. A regular Valentine IX had a maximum climb angle of 30 degrees. A Valentine IX with grousers increased this number to 32 degrees, after which the tracks lost traction. As for climbing in softer terrain, the number was the same: 30 degrees. Driving on a tilt was also similar: 29 degrees without grousers, 30 with. After that the track was thrown. Aftermath of driving on a railway platform. The effect of the surface on which the tank drove was much more severe. During railroad loading trials, the platform was partially destroyed, both the wooden and metallic components. The asphalt also suffered. Valentine X in Kubinka, summer of 1944. NIBT staff assumed that the cleats would be more effective in the winter. There were some doubts about this, as the effectiveness would be better on ice, but in any other case the cleats would not perform as well as the welded on grousers developed back in early 1942. In order to reduce the impact on roads, it was decided to leave the cleats on every fifth track. Whether or not this suggestion was carried out is unknown. At the very least, this was communicated to military QA in September 1943. No serious trials of this tank were performed. A Valentine X made it to the NIBT proving grounds as well. Tank T.123484 arrived in the USSR with convoy JW-56A on January 29th, 1944, on board the Fort Slave transport ship. 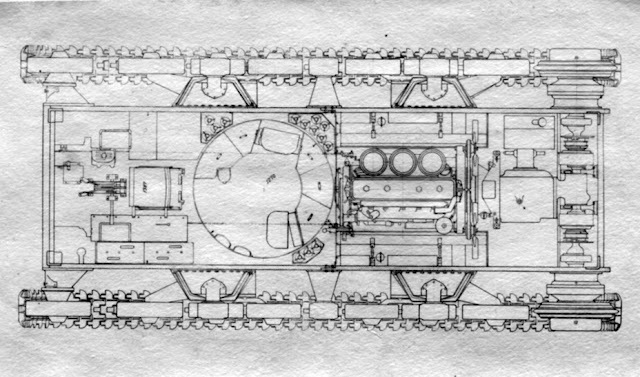 Study of this tank did not progress past a technical description. The NIBT photo album has the same description for this tank as the Valentine IX. The introduction of a coaxial machinegun had an effect on the 6-pounder gun: the amount of ammunition decreased to 44 rounds. The tank carried 1800 rounds for the BESA. Valentines with 6-pounder guns began reaching the front lines closer to the fall of 1943. Initially their numbers were few, as shipments along the northern route nearly ceased in the spring of 1943. The situation with 6-pounder guns also had an impact on their shipments. 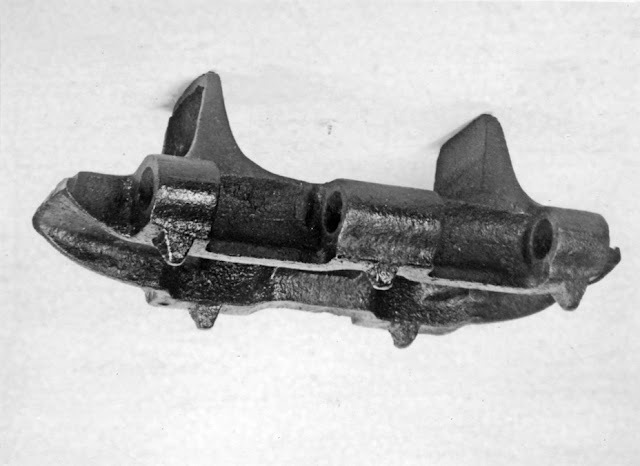 Defects observed during training in the spring of 1943 were the same ones that the British reported: the cover of the cradle and the recoil brake rod became deformed during firing. Issues were reported as late as June 1943, which resulted in some delays with the use of these tanks in combat. A Valentine IX tank crossing the Dnieper, November 1943. The new tanks triggered a mixed reaction, mostly because of the lack of coaxial machinegun. 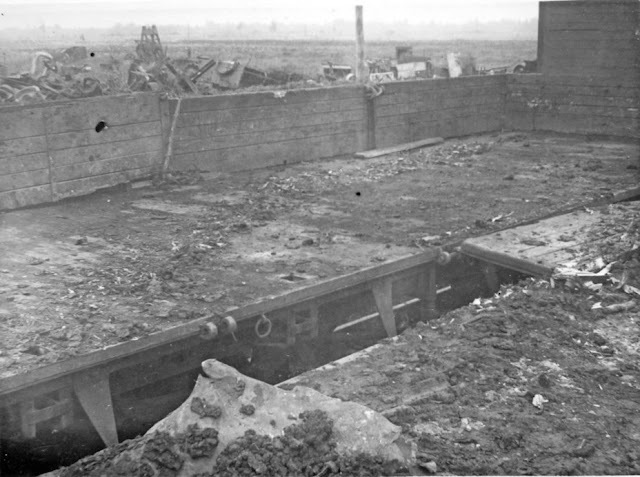 Cases where tanks were used in mixed formations were common. Brigades received 2-pounder Valentines along with Valentine IX tanks. They were less effective in combat against enemy tanks, but they had a coaxial machinegun and a bomb thrower. Even these tanks did not have an HE shell. Requests for HE ammunition increased in volume in the summer of 1943. Information of the British having such ammunition came up in May, but no shipments were made either in 1943 or early 1944. Shipments of Valentine IX tanks became truly large scale only in late 1943. The first shipment of HE ammunition for the Valentine IX. Initially there was a very small number of these shells available. Help came from the USA. 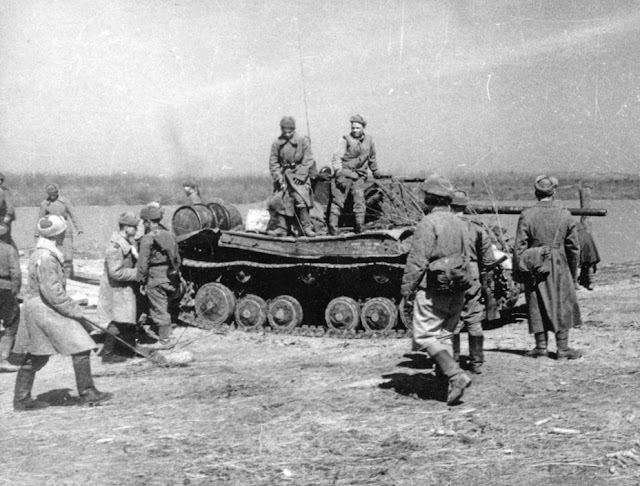 American tank GMC T48 tank destroyers began arriving in the USSR starting with late 1943. They were initially aimed at the British market, and armed with the 57 mm M1 gun, an American copy of the British 6-pounder. The same weapons were used by the British army. The Americans were shocked at the lack of an HE shell for this gun and developed their own. It saved the Valentine. On March 10th, 1944, trials of American and British 57 mm ammunition were performed at the Gorohovets proving grounds. Firing the GMC T48 (Soviet designation SU-57) showed that the ammunition used by the guns was the same. This was a signal that HE ammunition could be used in Valentine IX and X tanks. The first shipment came in late March of 1944. Tanks were equipped with 50% AP and 50% HE ammunition. However, at first the shipments of HE ammunition were scarce. Because of this, some tanks still only carried AP ammunition in the spring of 1944. The situation finally improved in June of 1944. Soviet crews often used the Bren gun to fire at ground targets. A Valentine IX that was knocked out and captured by the Germans. Fall 1943. "The 57 mm gun has good ballistic characteristics. It can penetrate the 82 mm thick side of German T-VI tanks from 600-800 meters. The lack of HE shells makes the tank ineffective against enemy infantry. This tank is used to combat enemy tanks like a tank destroyer." The introduction of an HE shell permitted the use of homogeneous units. For instance, on March 29th, 1944, the 54th Independent Tank Regiment received 20 of these tanks when it was reformed. Only 8 HE rounds were issued per tank, but this was a start. The regiment was previously equipped with T-80 tanks, so it is doubtful that they viewed this as a downgrade. The regiment largely faced enemy infantry and artillery when fighting alongside the 12th Guards Cavalry Division. By May 14th, it had 12 remaining Valentine IX tanks. These tanks were called MK-IX, MK9, or Mk-9 in documents. 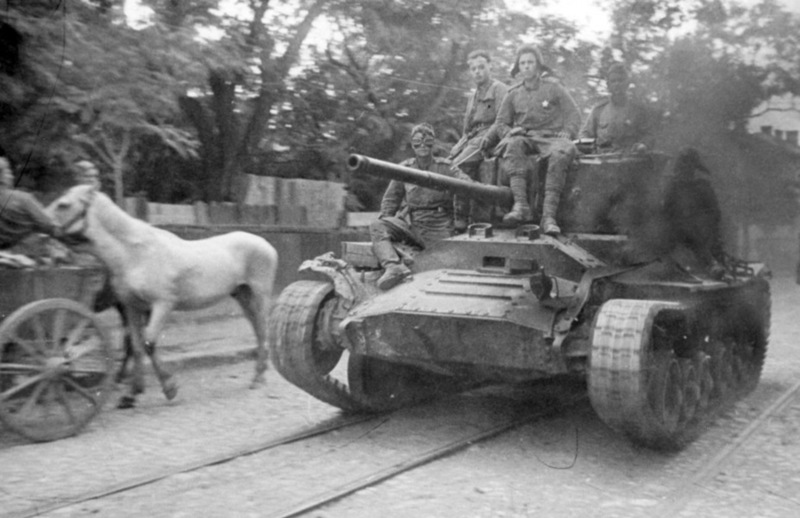 Note that tank regiments in cavalry units had a lot of this type of tank. 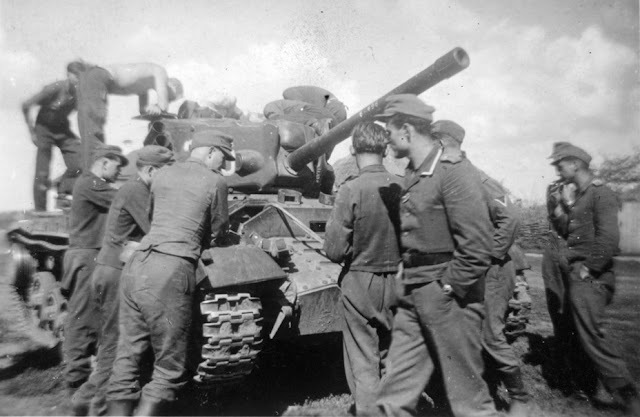 For instance, the 61st Independent Tank Regiment had 15 Mk.IX tanks as of July 8th, 1944. A Valentine IX in Vilnius. Despite some issues, the light tanks with 57 mm guns were remembered fondly in the Red Army. The tank was low to the ground and quite during motion. It could handle its job well. The slow speed was relative, and often the difference in speed was not great when driving on dirt roads or off-road. Valentines were also very reliable, especially when used according to instructions. Many of these tanks remained in service into 1945. Near Bucharest, Romania, August 1944. 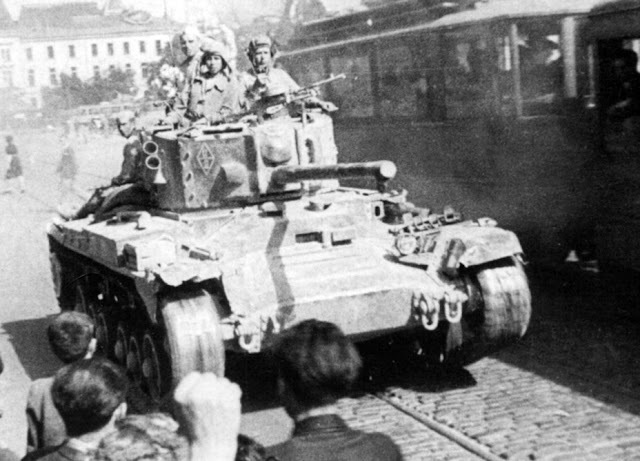 The 151st Independent Tank Regiment is a good example of the use of the Valentine IX in combat. This tank regiment had a mixed composition: in addition to 6 Valentine IX tanks it had 4 Valentine III and 10 "M3 light" (likely the Light Tank M3A1). On March 26th, the regiment crossed the Gron river alongside the 9th Guards Cavalry Division. The tanks drove for 48 km that day and settled down in near the Rendva village in Slovakia. Fighting alongside the cavalry, the tanks pursued their retreating enemy, periodically getting into skirmishes. 30 German soldiers and officers were killed on April 3rd during the battle for Trnava. Šaštín-Stráže was taken on April 4th at the cost of one Valentine III and 1 M3 Light. 4 crewmen were killed, 5 were wounded. Battles for Lanzhot in Czechia were much more heated. The regiment took an active part in the fighting for the city on April 11th, losing one Valentine IX and 2 Valentine III burned up and 1 Valentine IX and 1 M3 Light knocked out. One enemy tank was destroyed with return fire, one knocked out, and up to 80 soldiers and officers plus one armoured troop carrier were destroyed. Fighting for Trvonice cost two knocked out Valentines and two M3 Lights. In return, the Soviet tankers destroyed 145 soldiers and officers, an anti-tank gun, and an APC. The regiment fought on until April 19th, when orders were given to transfer the tanks to the 9th Guards Cavalry Division. During its fighting career, the regiment claimed 5 burned up and 1 knocked out Panther tanks and 380 enemy soldiers and officers. Only one Valentine IX from the Red Army survives to this day. This tank fell into the Varta river in January of 1945. 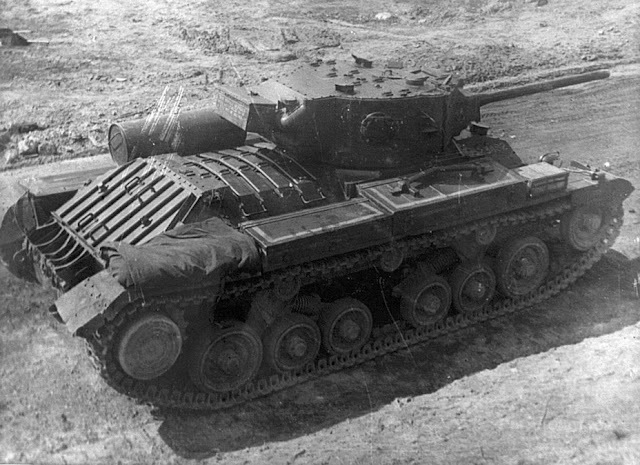 Tank T.122834 produced by Elswick Works in February of 1943 came into the USSR through Iran on December 29th, 1943. Presently it is being restored by a Polish collector.